22 We know that the whole creation has been groaning as in the pains of childbirth right up to the present time. 23 Not only so, but we ourselves, who have the firstfruits of the Spirit, groan inwardly as we wait eagerly for our adoption as sons, the redemption of our bodies. Our devotion is all about groaning. 1. Creation groans. If humankind's rebellion against God was the nuclear explosion then the dark side of creation is the fallout. Natural disasters, disease, drought, famine, earthquakes, floods - these are all the after-effects of the sin of humankind. Creation was created good and while it is now subject to the wages of our sin, there will come a time when creation will be restored. 2. We groan. When we see the effects of our brokenness - when we suffer or we see others suffer we groan. Instinctively we rebel at the incongruity of death and suffering, somehow knowing that there is more to it than this. Somehow we know that there is something greater coming, but it is not here yet! 3. The Spirit groans. Did you know that you are a prayed in, prayed for, prayed through person? The Holy Spirit who lives in us is praying 24/7 for us lifting us to God. Especially when we suffer. It is He who asks the Father to strengthen, renew, and restore us in the midst of our struggles. God has a plan - suffering will end in the new heaven and earth. Our groaning is heard by God. Our present sufferings are not worth comparing with the glory that will be revealed in us. As child, I loved John 11:35 - It's the shortest verse in the Bible and great as a memory verse. The problem is that in thinking about it as the shortest verse, we lose the significance of this amazing picture. So let me set the scene. Jesus is good friends with Lazarus and his sisters Mary and Martha. While He is out of Judea, teaching and ministering, He gets the news that Lazarus is sick. Unexpectedly He does not rush to heal, but delays, explaining to the disciples that Lazarus is going to die and that he will be raised from the dead. Four days later Jesus arrives in Bethany where He takes time to let each sister vent and release their pain. It's beautiful to watch how He allows them to grieve in their own unique way. Then they go to the graveside along with all the mourners and then this verse occurs. Jesus weeps. And the burning question is "WHY??" Why does He weep? He's about to raise Lazarus from the dead!! He's promised this all along!! He should be as smug as a magician about to pull a rabbit from the hat! Weeping just doesn't make sense! - He is weeping in angry frustration at the grip that death has over us. What an incredible thought: that the Son of God feels our sadness and pain and that, even when He's about to fix it all, He still cares about what we are going through. When it rumbles and shakes, when the world is filled with heartache and pain, when our hearts are breaking. God weeps too. to you whose throne is in heaven. for we have endured much contempt. Waiting for justice to be done. Waiting is easier when there's a clear time frame. If I have to wait until 15h00 this afternoon it is easier than waiting for the phone call that may or may not come. The psalm puts us in the shoes of someone who has suffered injustice and arrogant contempt. One would hope that righteousness would prevail - that good would win the day - that the wheel would turn and people would reap what they sow. But this doesn't always happen. (Not according to our timetable anyway!!) The Psalm doesn't indicate that God has delivered or that God has answered - in fact, the entire Psalm is just these four verses in which the Psalm writer calls out to God and self-identifies in the imagery of a manservant or maidservant and then states the desperate need they find themselves in. The servant imagery is tough but yet comforting. It's tough because we like to be in control and be masters of our own destiny. It's hard to admit that we don't know everything and that we can't control the world around us. It's hard to realise that sometimes God works outside our ability to comprehend. But there's comfort too. The man and maidservant look to the hand of their owners because they trust them and because they are good. The text almost implies that their eyes are drawn to their owners. It is a picture of trust and affection. They have learned that the Master is faithful. Waiting teaches us how powerless we are. Waiting also reminds us how much we need God and how much we trust Him. When times are tough we are often bullied by our circumstances to make knee-jerk and emotional decisions. Today's dev (which is a re-working of something I wrote previously) is a call to walk straight paths instead of being "blown and tossed by the wind." are parallels - they're driving home the same point. This much-loved passage asks us to Trust and Acknowledge God. To trust God is to believe that His love for us remains unchanged, in spite of our circumstances. So often trouble comes and we feel that God has forgotten us and doesn't love us but trust looks past trouble to God's faithfulness. To acknowledge God in all our ways is to live in constant awareness of His presence. We need to be willing to sign the name of Jesus next our name on every credit card slip and every contract and letter. We need to consider Him as being part of every discussion and with us in all we do. In Hebrew culture life is often represented as a pathway. The image created here is that it is better to walk a pathway with God than to blaze a trail on our own. With God at our side, our pathway will be straight and not crooked. When we lean on our own understanding without Trusting and Acknowledging Him, our pathways start to twist and turn. Even if we mean well and start straight, our lives are not meant to be lived for ourselves - we are designed and created to Trust and Acknowledge Him. When we lean on our own understanding, it is mutiny. BUT let's be clear: This is not mindless Christianity. We don't have to leave our brains at the door. It is about reliance on God. We lean on a walking stick when we are injured, tired or going through heavy terrain. We should thoughtfully and mindfully lean on God. In order to be purified gold has to be melted. Being a heavy metal, gold sinks to the bottom and the impurities (dross) float to the top. Fortunately for gold, it has no nerves, emotions or fears. When it comes to the refining of our faith, we are slightly more sensitive than gold(!). The smelting of our faith - reducing it to the fragile liquid form - is traumatic for us. Whether the trials are physical illness, loss, stress, persecution or uncertainty, we fear the process because we have nerves, emotions and fears. Although God is not the author of our trials, He does allow them to come and then transforms our suffering to bring about our growth and development as people and as believers. This is where Peter's "in this" is so important: Trouble, brokenness and trials are a reality of a world broken by sin - they are inevitable. But Jesus experienced ultimate darkness and brokenness on the cross and conquered it in resurrection and so we are never alone. As we face trials God is mischievously at work. He transforms the trial that evil would use to destroy us and He lovingly refines our faith. (Imagine the gold of faith being poured into God's hands instead of a mould then we get the right idea...) The results of smelting, if we remain in the hands of the Master Craftsman, are beautiful: We become people lovingly shaped by Him. It would be a lot better if the second word in James 1:2 was if and not when! Jesus warned His followers that His peace was not like the peace of the world. The world reckons peace to be the absence of trouble. Jesus and James' arithmetic is different: trouble + grace = peace. One might even define James' attitude as masochistic: His attitude to trouble and hardship is joyful acceptance: Bring it on! But is he really masochistic? A masochist likes to be hurt. James does not concentrate on the hurt or hardship, but on the results: perseverance, maturity, and completeness. James is not interested in the beginning of the process as the end. To this end, it would be better to define James as an opportunist. Trouble is an opportunity to grow. Like a muscle that can only be developed through load-bearing, our faith must be pulled, stretched, loaded and burdened before we can really grow. As far as my faith is concerned, I want to have depth, insight, wisdom, stickability, and courage. The road to that destination leads through the badlands and wastelands of life. Trouble is not to be sought or enjoyed, but when trouble comes knocking, there is a sure and deep certainty (joy) that while God is not the author of trouble, He will be with me and can use this experience to help me grow as long as I sidestep the temptation to become bitter and cynical. God turns trouble on its head by mischievously bringing growth and good out of evil's attempts to destroy us. A trial can be a trail to a new destination. Let's find deep contentment (joy) in that! The word Selah occurs in a number of Psalms. It is a puzzle to commentators and scholars because there are no indications as to what this word actually means. We only find it in Psalms and in Habakkuk's song of praise and not in any other literature. The best guess that scholars have as to what the word means is that it may indicate a "rest" for the singers while the musicians play a musical interlude. Many have suggested that "Selah" means "stop and think" or "reflect." God is more powerful than the agents of chaos and we have to turn from them and trust in Him. "God is our refuge and strength, a very present help in trouble"
The LORD Almighty is with us;the God of Jacob is our fortress. This third part of Psalm 46 can be jarring when we read it. Verses 8 & 9, which speak of God's powerful and mighty works in bringing an end to war, contrast sharply with v.10 "Be still, and know that I am God." This jarring is because we have often used verse 10 out of context. All the bookmarks and scripture posters I have seen depicting this verse have been the quiet peaceful under-the-tree-by-the-gently-flowing-river type of picture. Typically they depict the idea of an individual coming quietly and meditatively into the presence of God. It suggests nations at war being brought to a standstill by powerful claims of God's majesty and might. It is a call to be still (to cease, to stop, to desist) in the midst of clamouring and tumult. It's a clarion call in the midst of battle. It's a reminder that even when we are in the midst of the hurly-burly and chaos, God-is-with-us and God-is-God! One of the best depictions of this is found in the New Testament when Jesus crosses Galilee with his disciples. Jesus is asleep in the boat when a furious squall comes up and terrifies even the experienced fishermen in the group. They wake Jesus up with frantic cries: "Teacher, don't you care if we drown?" Jesus calming the storm is a much stronger picture than our tree-by-the-river scene. 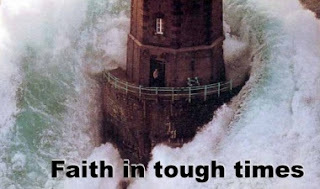 Have a look at the picture that came with the first part of the series... You can see the lighthouse keeper standing serenely in the doorway while the waves crash around. He knows he is in a secure fortress. In the midst of the chaos and storms remember: "The LORD Almighty is with us - the God of Jacob is our fortress." Because sometimes He calms the storm and sometimes He calms His child. ...and sometimes - as we rush around frantically - He has to challenge us to "cease and desist!" But how do we find strength IN the midst of trouble? How can we triumph over the fear that the "rumblings" bring? How can we protect our hearts and souls from being hijacked by shaking mountains and surging oceans? By going to the river. But wait-a-minute! Jerusalem doesn't have a river! So how can a river "make glad the city of God"? Worship (and I don't just mean singing) is a key to overcoming fear. When we come to worship (and it's not about the building) we are dipping our toes, wading or swimming in the river of God (go and look at Ezekiel 47) and we find strength, courage, comfort and peace. There has been a lot of pessimism around the start of 2016. And, to be sure, there is a lot to worry about: from the economy and a plummeting rand to horrible racism in our media to a horrific road death toll over the holiday period to increasing concern about the corruption and self-interest in many of our politicians. This morning I was devastated by the news that one of my colleagues in ministry, Rev Cliff Leeuw, was stabbed and killed on a beach in East London. Cliff was a giant of a man, a fearless God-and-people-lover who built bridges between people and who, with booming voice and beaming smile helped people worship God. I have also just had the news that Rocky Valley, our Presbyterian Youth Camp site in Krugersdorp was devastated by a hail storm on Saturday. Ten roofs have holes in them, 76 windows are broken and there is extensive flood damage. On New Year's day at our special evening service I pronounced the benediction saying that 2016 was going to be a tough year, but that we would face it with faith and courage. My words were - "Our God is with us - so bring it on." But God is our refuge and strength. Our God is not only the God of the tranquil moonlit night, He is the God of the thunderstorm and the earthquake, wind and fire.